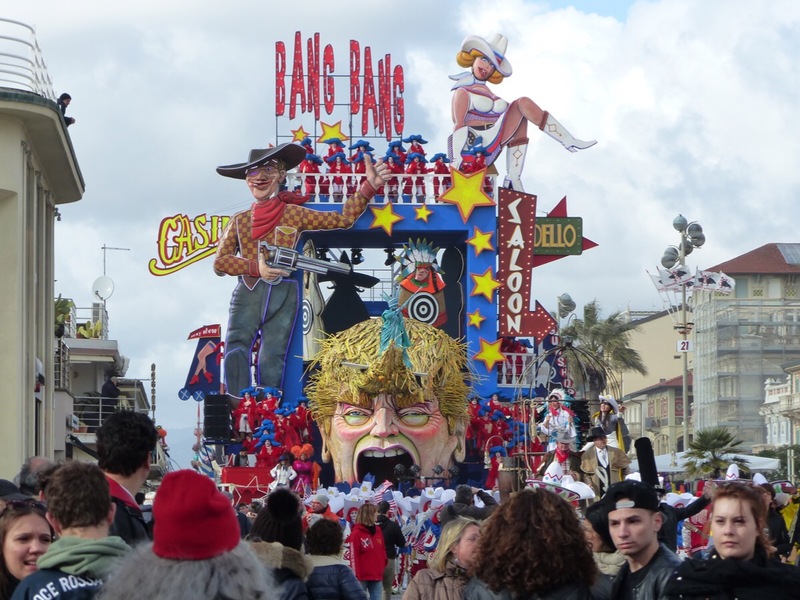 I love to go to Viareggio to see the fabulous floats that take to the street at Carnevale time. They are often a satirical take on politics. 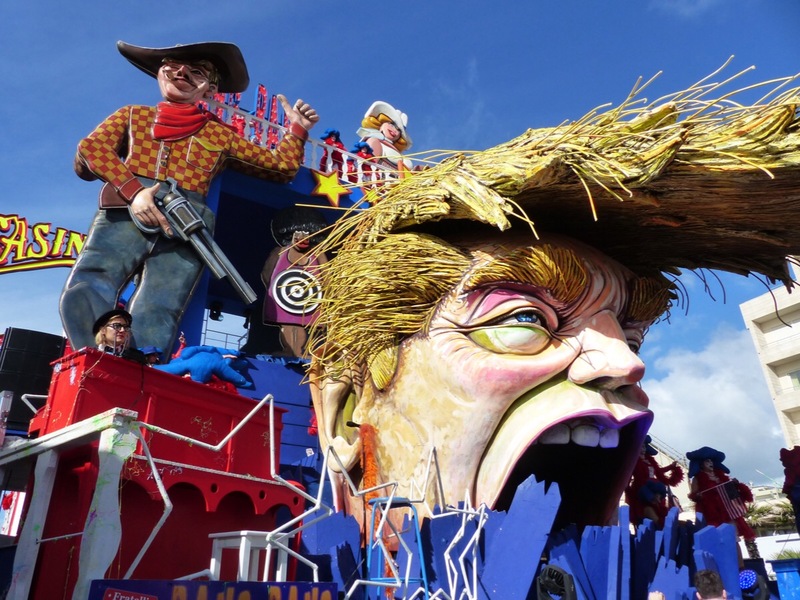 Donald Trump is an obvious target and his float was my favourite this year. 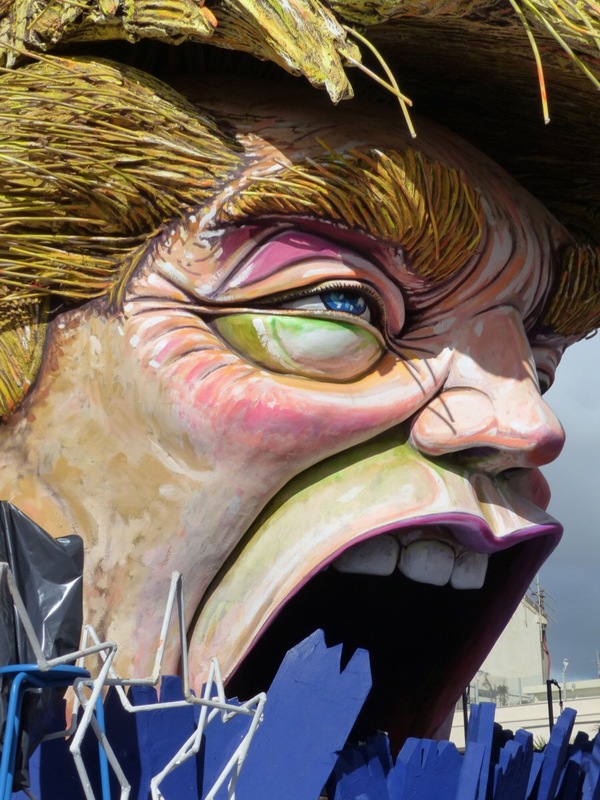 The artists did a great job on his likeness. I particularly liked his eyes…very lizard like. Donald’s hair was spectacular. It pushed forward from his head like a wave. 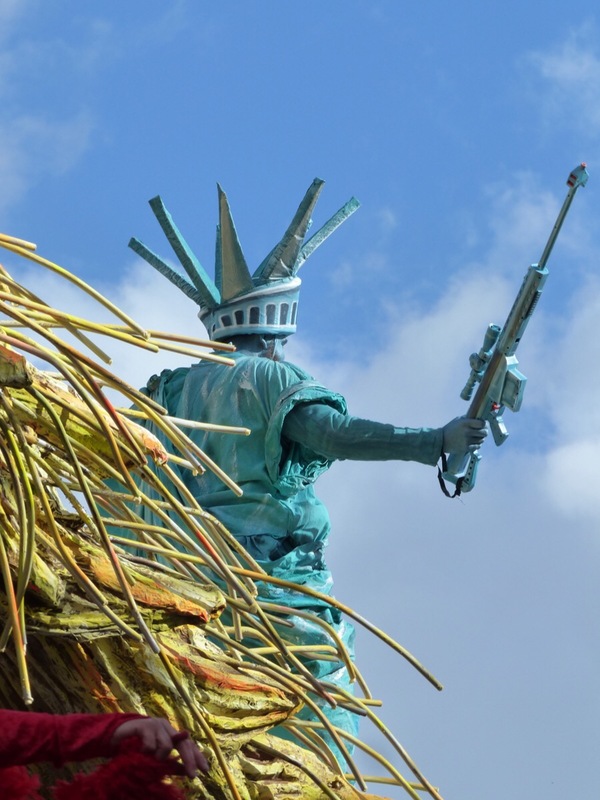 In fact the Statue of Liberty brandishing a gun surfed on a board from the end of his hair. 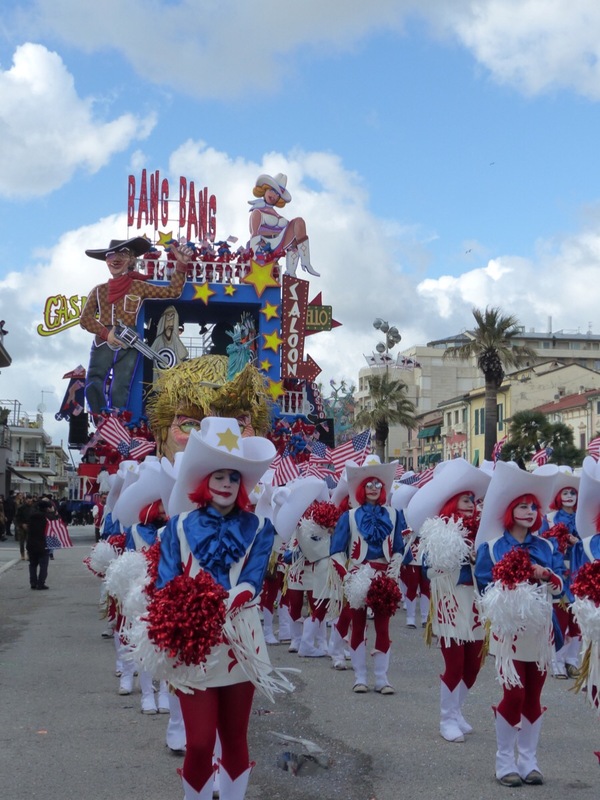 The float was led by a team dressed in red, white and blue. 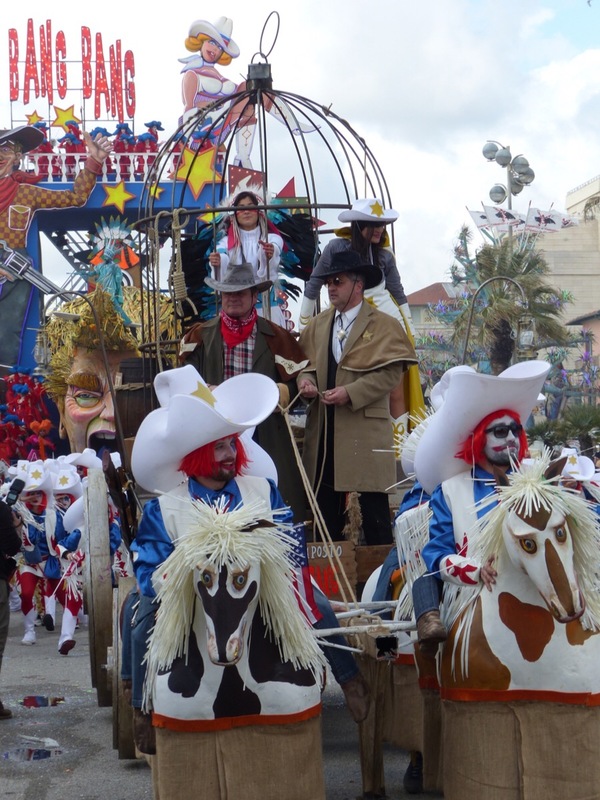 Men on horseback were there too…with a native American in a cage. 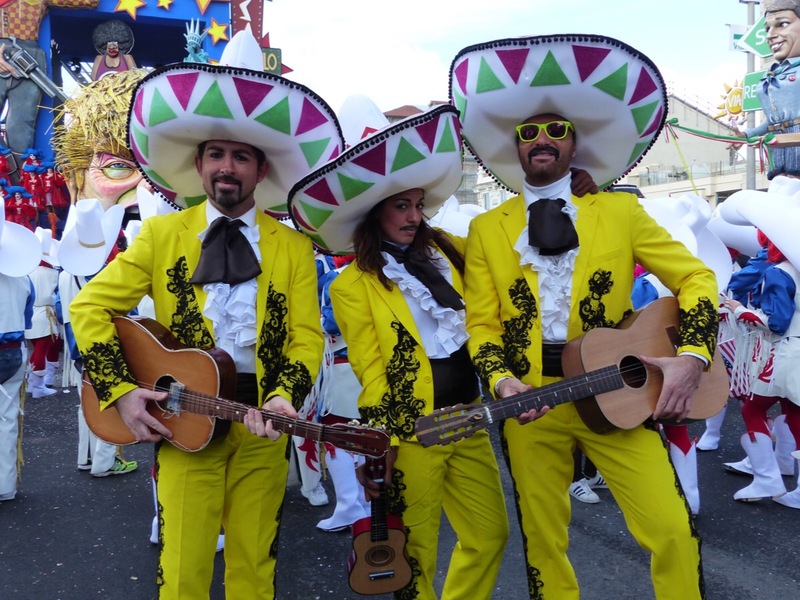 A Mexican trio provided music. 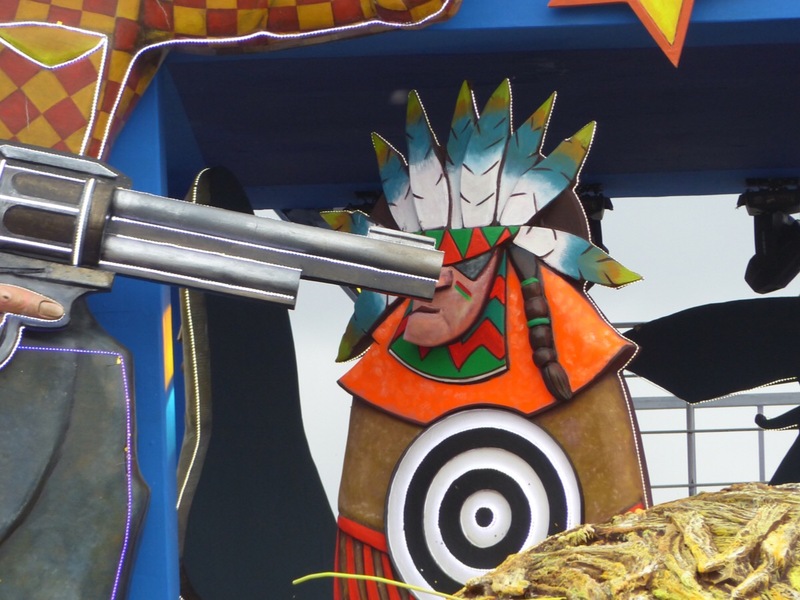 At the top of the float 4 targets rotated in front of a gun toting cowboy. Guns and violence were a theme. The support team looked great. Donald, please note the lack of an audience for you in the grandstand. 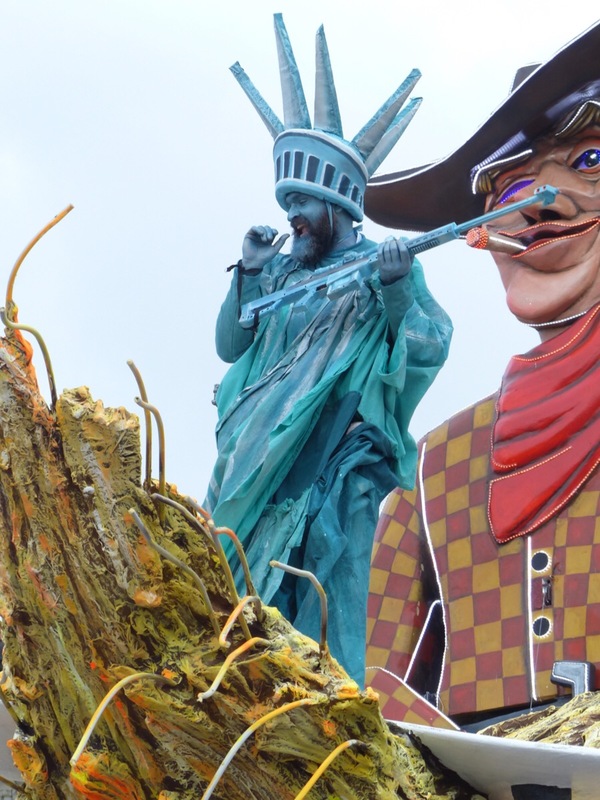 I will show you the other floats in the next post. I thought it was fabulous. I hope he gets to see what was done. Lots of imagination, artistry and humor. Well done! There weren’t as many floats this year, but they were very good. Wow … a lot going on in that work … much more than I caught on first glance! 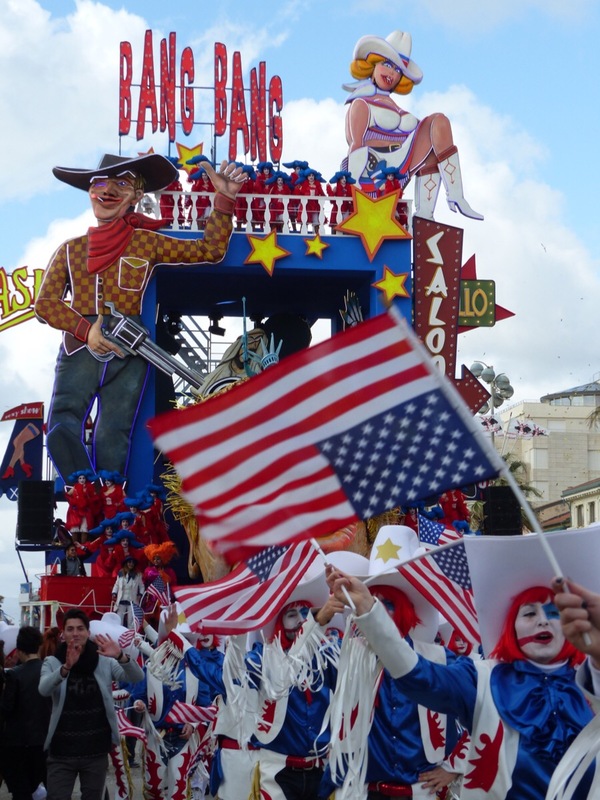 There are lots of people involved in each float. They are amazing. depiction, dead on …. the talent, priceless!! 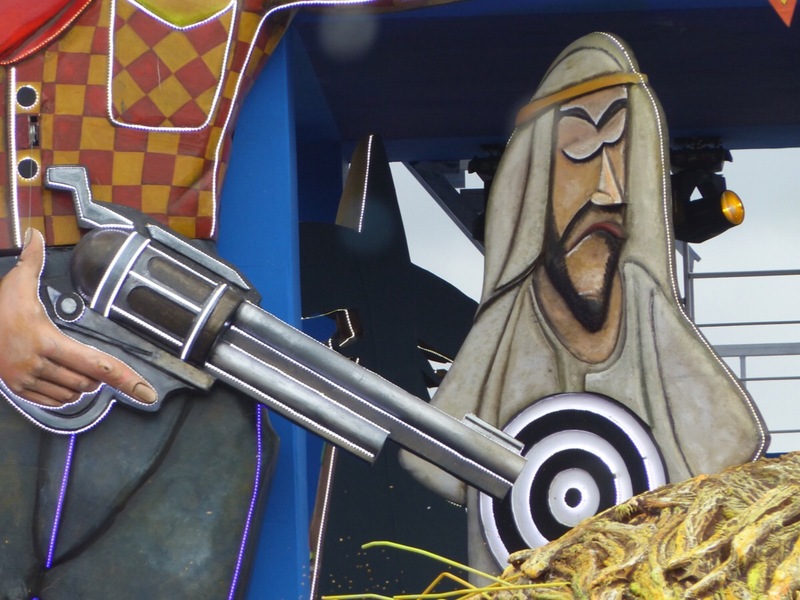 Months of work go into these floats. Yes, the man is a fool. Let’s hope the next few years pass without too many disasters. Very clever so much going on! So much hard work and commitment. Good for them. I hope someone shows Donald the efforts on his behalf. 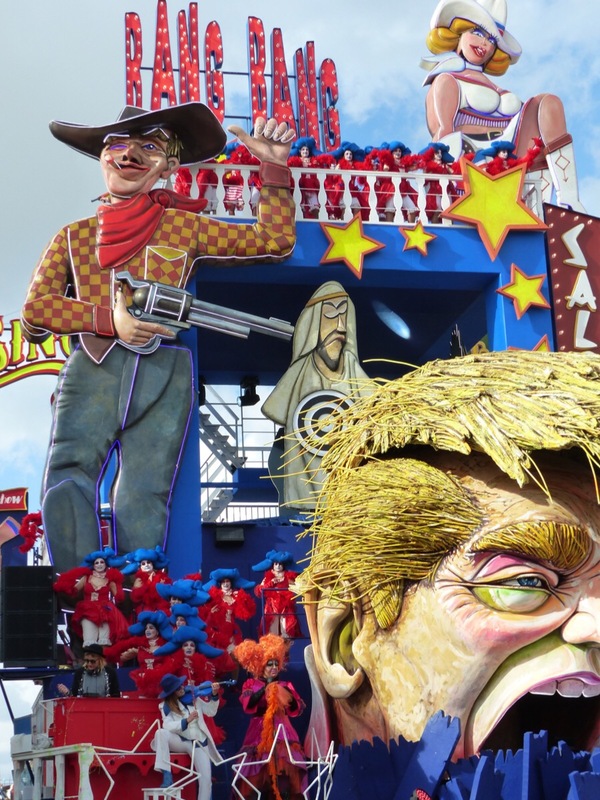 The floats are incredible. You can visit the workshops to see how they are made. 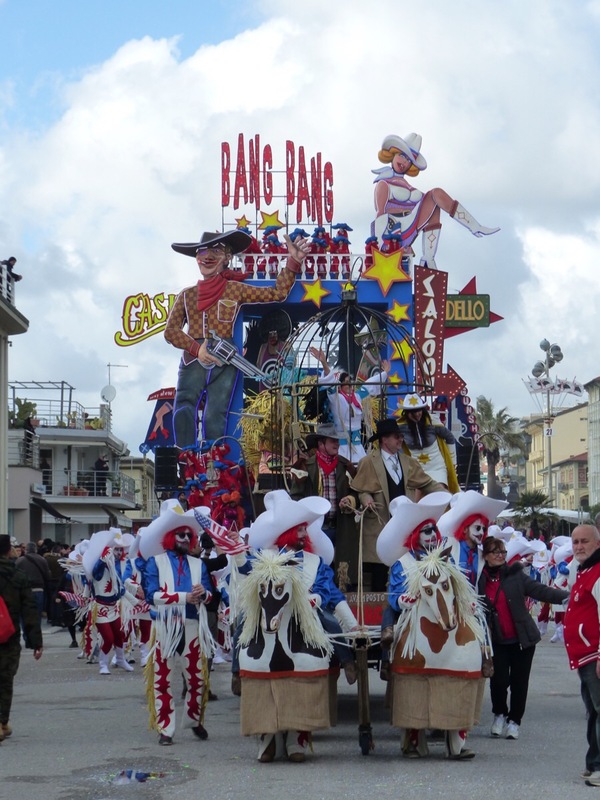 My grandfather visited Viareggio often as a child, as he grew up in Bagni di Lucca.He came to America after narrowly escaping Benito Mussolini. 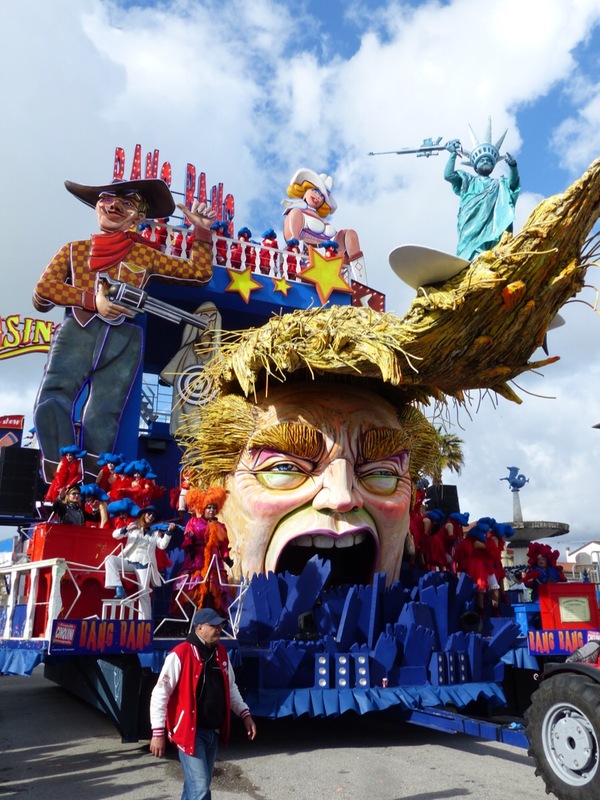 I certainly believe he would be disappointed on how this float reflects an anti-American sentiment, as it depicts hatred and the furthest from the truth. My family lives in southern California, and our area has been seriously impacted by the problems caused my illegal immigration. 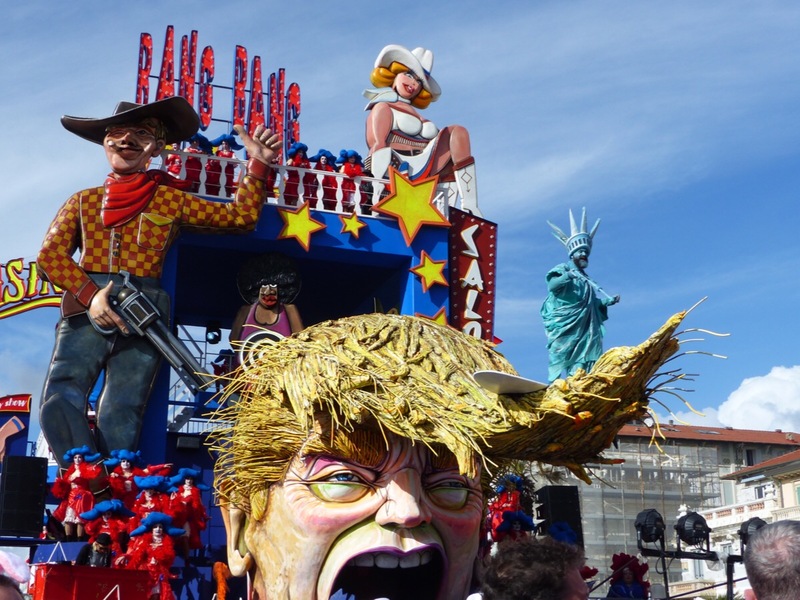 Many of the floats are political comment on several countries. I think this is a comment on Trump, not America in general. Most of the world thinks he is a stupid thug. I’m surprised you would make a malicious comment like that! 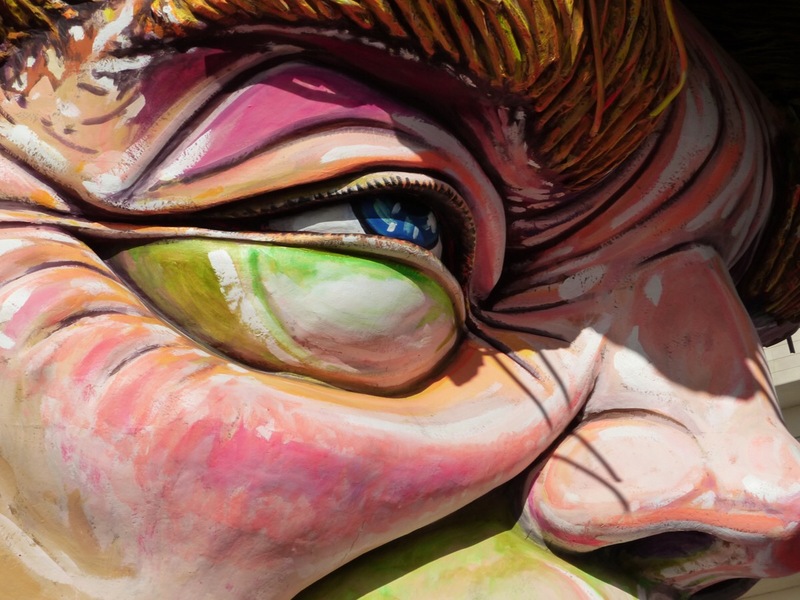 Donald Trump is not viewed favourably by the world outside America…and by many inside the country. I think your grandfather would have been happy that it is possible to criticise a government. Mussolini would have had you shot for that. Hi Debra. 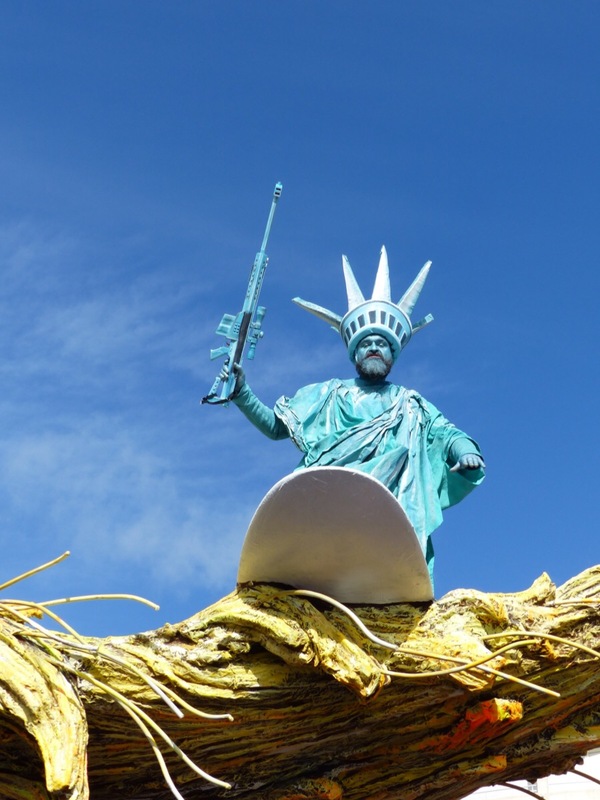 Great blog…great photo’s, your sentiment is the sentiment of many, in and outside of America. Thank you. The world is watching in amazement. I will sort the photos soon. 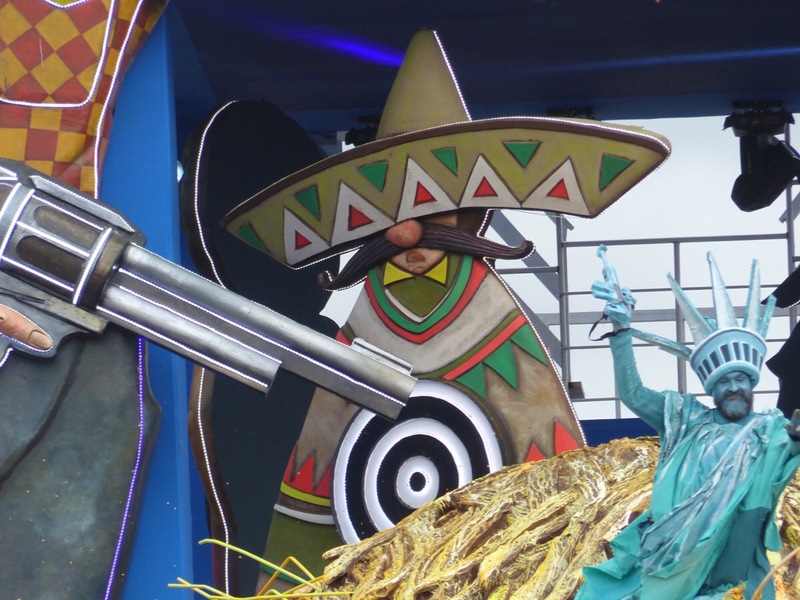 There are no barricades so it is possible to get quite close to the floats. Perfect! 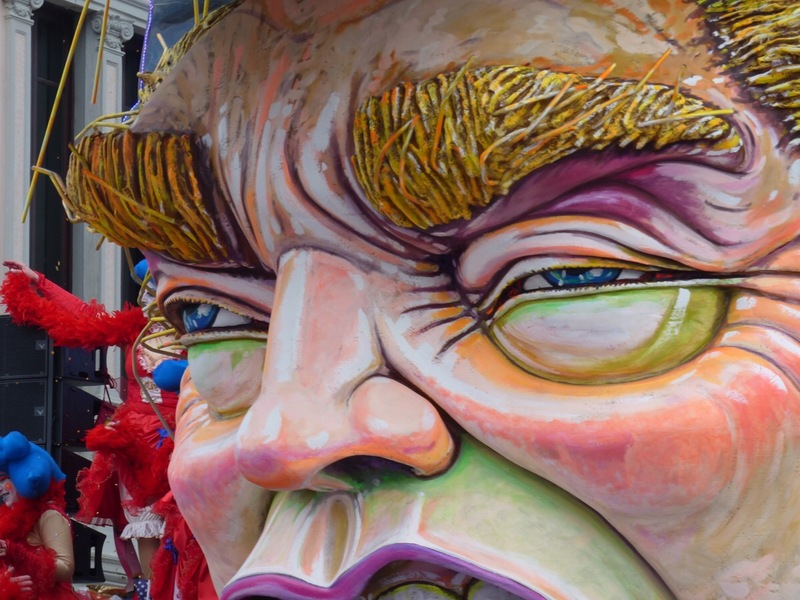 Actually, when you think about it, what he is doing is asking everyone to not believe their eyes and ears and that would fit with the true meaning of Carnevale, wouldn’t it? Something out of this world. I still can’t believe that anyone would vote for this creep. 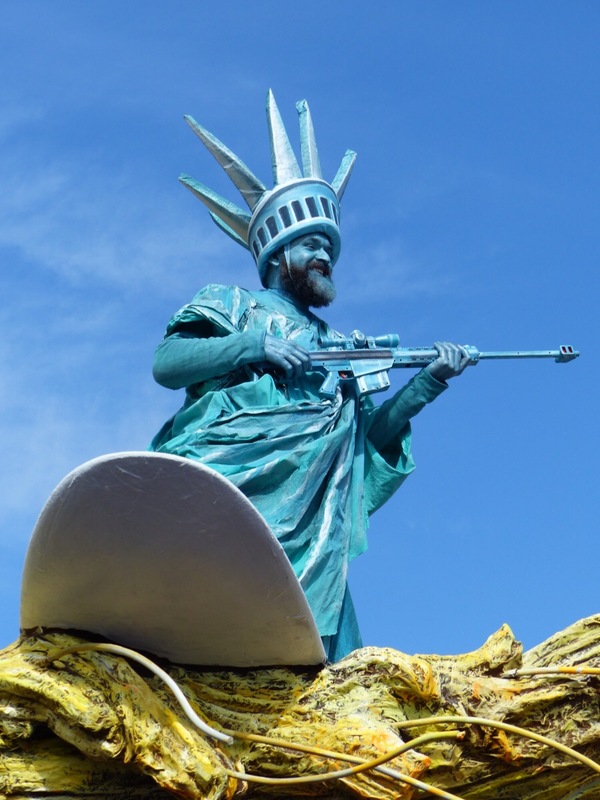 He is such an easy target for ridicule – great art work! He is an easy mark, but they have done it well. That was a brilliant post, Deb! 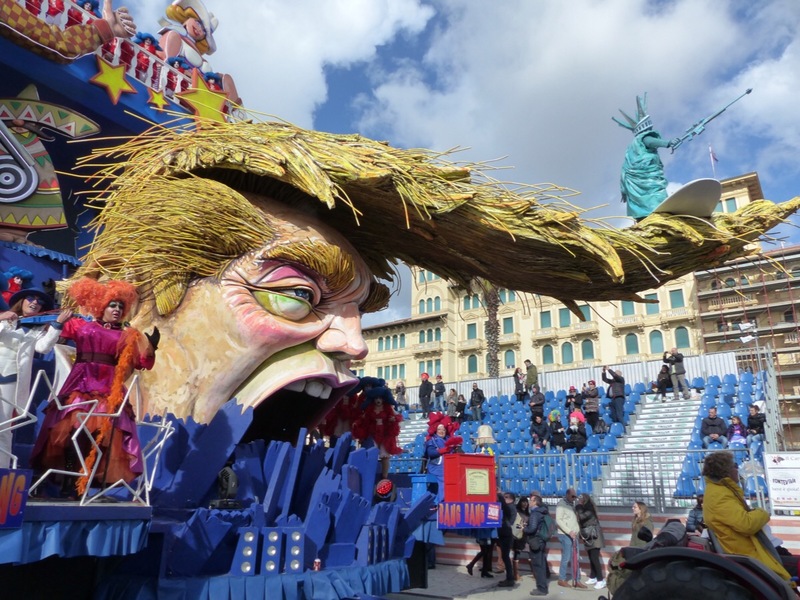 The Italians know how to show satirical politics on a grand scale. Just shows what this part of the globe thinks of Trump’s ‘America’ with this megliomanaic still new in his office. Well done, Deb! 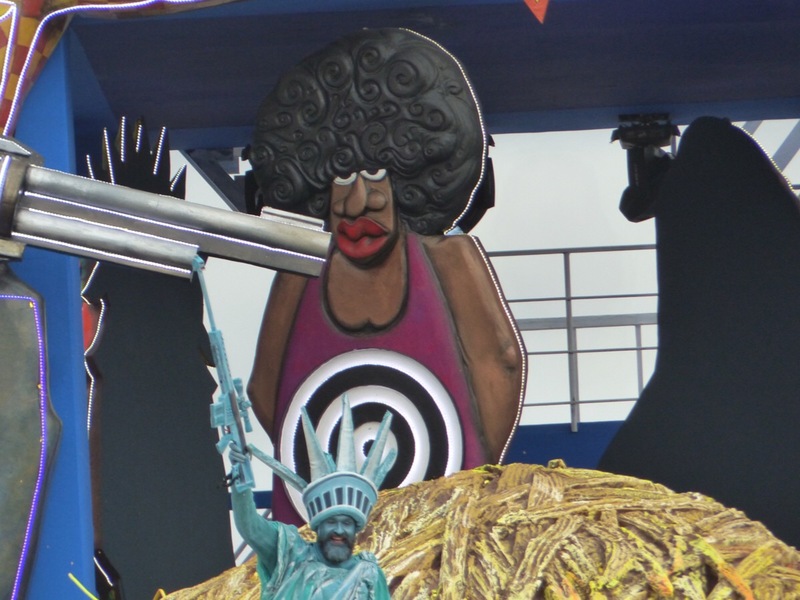 Can’t wait to see the other floats in your next blog. 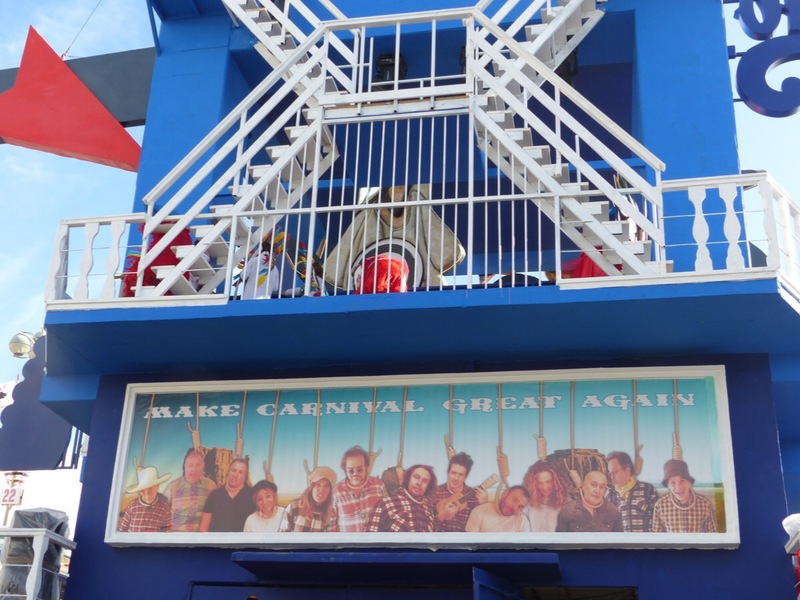 I think they did a great job on Donald. How did anyone vote for this man? 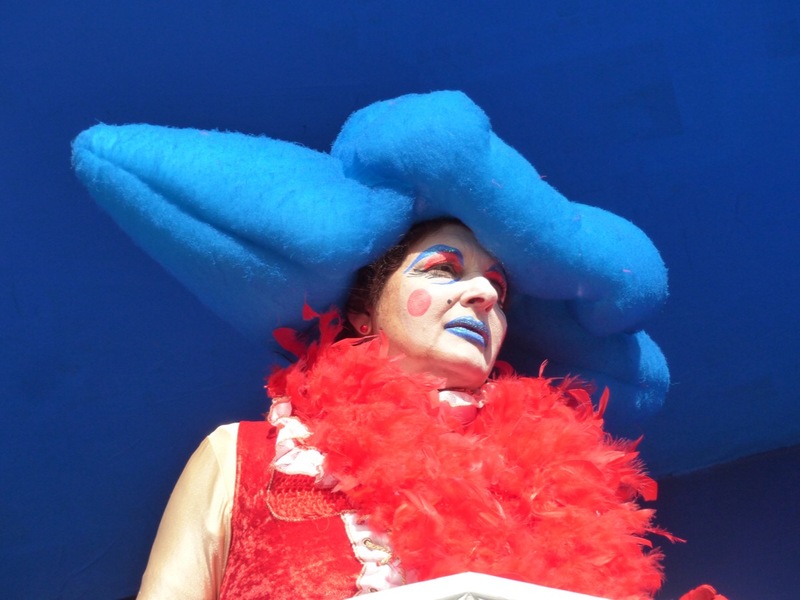 Hi Debra: The floats are spectacular! I doubt very much that people will blame individual Americans for Trump. The whole world has gone a bit mad. You will have a great time in Lucca. April is a beautiful month. Everything will have its new green coat on. Thank you! Look forward to seeing this beautiful country. My daughter gave me a new watercolor set. Can’t wait to use it in Italy! I have travelled in America quite a bit and I think it is a fabulous country, but I am not going there while he is in power. I don’t blame you Debra. It has been very very hard. I am so distraught. It has really opened my eyes too as I live in such a bubble world. I honestly thought it was a joke that he was even running and it proved me wrong. I just hope we can mend the immense damage that will be done. Only the Italians can do it so very well.